Home / Blog/Training Tips / Socialization – what does it mean and how do I do it? Socialization – what does it mean and how do I do it? I hear the term “socialization” thrown around a lot and it often makes me nervous because it seems as if some people think that “socializing your dog” means taking them everywhere and throwing them into many different situations while not taking the dog’s emotional state at the time into consideration. Here’s the thing, Socializing does not mean just throwing your dog in to new circumstances and letting him “deal” with it. Socialization actually means desensitizing your dog to many different people, places and things. The first step is being able to “read” your dog and know if your dog is comfortable or uncomfortable in a given situation – check this out first to find out! Also, socialization does not end after one puppy class. A dog has three sensitive periods, the first at about 8-14 weeks old, the second at about 7-9 months (the onset of adolescence) and the third at about 1.5-2 years (the onset of maturity). Heavy doses of safe socialization and training are crucial during the first two years of a dog’s life. When socializing your dog to new things begin from a distance. Gradually get closer to the stimuli, give your dog a treat (or 2 or 3!) and encourage your dog in a “jolly” voice. Allow your dog to investigate and get closer only if your dog is comfortable and relaxed. If your dog is not comfortable or he is overwhelmed, get more distance and back away until he is relaxed again and do not let the person or dog approach your dog. From this point, start over trying to build the dog’s confidence and gradually get closer to the stimuli. The goal is to get your dog comfortable and confident around new stimuli that he has never encountered or that were previously frightening or uncomfortable to him. Once your dog is comfortable around new stimuli there are many good ways to socialize your dog but remember to pick the ways that are appropriate for your particular dog. Dog parks/Dog Day Care – If your dog enjoys the company of other dogs then dog parks and well-run dog day care facilities can be an option. If you are choosing to go to a dog park make sure your dog has a good grasp of “come” before you ever take him off leash. Make sure the day care does not have too many dogs in one area and is supervised by knowledgeable staff at all times. The day care staff should be fluent in reading canine body language and not use aversive techniques (shouting, shake cans, mention being “alpha” etc.) for control. If your dog does do well and enjoy day care, do not take him 5 days/week! 2-3 days is plenty even for a very active dog. Your dog needs to do a variety of activities to become “well-socialized” and when dogs are in day care everyday the other activities become few and far between. Tandem Walks with another Dog. Dog parks and Day Care however, are not good for all dogs. If your dog is, let’s say “choosey” about his dog friends and big groups are not for him, start by taking your dog and the potential new friend for a leashed walk (walking parallel, not straight at each other!) together first and see how they respond to each other. If they can relax while walking next to each other, they may be a good match for off-leash play. 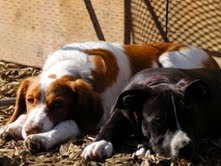 Even most dogs who “don’t like other dogs” are able to have 1 or 2 close doggy friends they can play with respectfully. Walk your dog in busy neighborhoods so that he can come in contact with other people, dogs and street noises. Always bring delicious treats to help desensitize your dog to these things. While you are there, sit at a coffee shop or outdoor café. Again, making sure your dog is comfortable in this environment. Do not make him sit there if he is in any way nervous or scared. Walk your dog past playgrounds/playfields and give him lots of treats for keeping his composure around moving children and balls. If your dog is uncomfortable or reacting (barking, jumping, lunging) on the leash then you need to get more distance until your dog can be calm. Enroll in a good, positive basic training class where your dog can practice his impulse control and learn to focus on YOU in a controlled environment. Take your dog with you! Dogs like to be with us – the more he gets to hang out with you and go places with you, the happier (and more social) he will be! Has your pup met the following? This is only a partial list – I’m sure you can think of more sights and sounds your dog will encounter! Go on – get out there (with a giant bag of treats)!